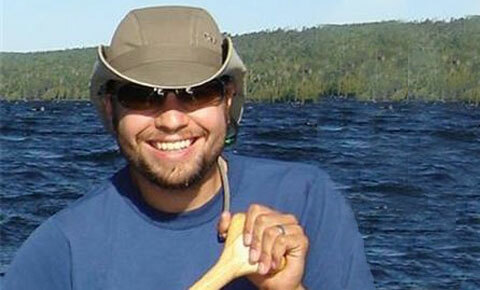 Dr. Joel Hoffman is a research biologist with the U.S. Environmental Protection Agency (EPA) Office of Research and Development, National Health Environmental Effects Research Laboratory, Mid-Continent Ecology Division in Duluth, Minnesota and has been involved with COSEE Great Lakes since 2009. His research is focused on understanding the effects of human impacts on coastal aquatic ecosystems. With a background in both traditional fisheries biology as well as chemistry, he uses an interdisciplinary approach, such as in his use of stable isotopes to understand food webs and aquatic ecosystems. He is also investigating how human intervention affects ecosystem services as well as fisheries population dynamics. Currently he is researching how Great Lakes coastal habitat degradation affects fish species by looking at stable isotope signatures of young fish to indicate nutrient pollution. "There is a long tradition around the Great Lakes of getting out into the wilderness, which makes people more interested in and more connected to science." 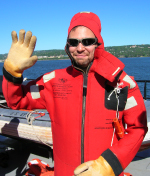 While Joel's job description does not include outreach per se, he is an active and enthusiastic participant in both COSEE Great Lakes activities and programs as well as volunteering both with the Great Lakes Aquarium and community organizations. He believes that his generation of scientists is faced with helping solve complicated environmental problems, which means not only being interdisciplinary – connecting with social scientists, economists, educators – but also means working with teachers and students through outreach. Working for a federal agency gives him a unique opportunity to do just that. "Outreach is part of my research," says Joel. "That’s the model. You are out there as a public servant and those things go hand in hand." Photographs and images for Joel's pages courtesy of Joel Hoffman, COSEE Great Lakes, and EPA.